You are here: Home » Blog » Compositing » General » Faking Reflections on set. This came up recently because there was no glass in the window of the set. All the reflections were to be added in post from photos…. but when the actor stood at the window the Director wanted to see his reflection. This is a simple trick for a locked off shot. The action is filmed with two cameras one for the main image and a 2nd camera for the refection. You can find the position of the main camera simply by reflecting the main cameras position in the mirror plain. 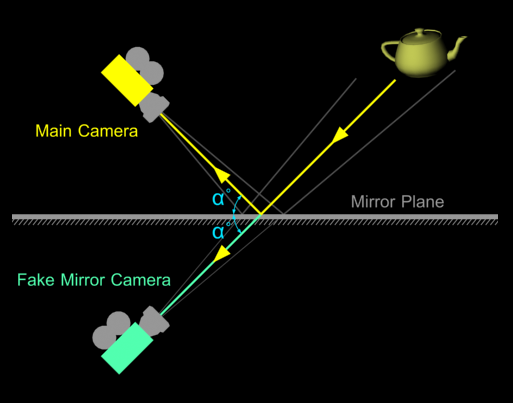 Both cameras are equidistant from the mirror and targeted at the same point on the mirror plain. both cameras should have the same FOV.